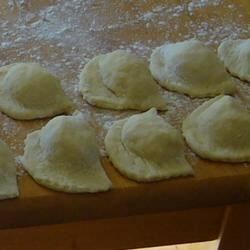 "Very easy recipe to make, and a wonderful twist to an ordinary perogy. These cheese filled perogies taste great just boiled or fried with a little butter. Eat them with sour cream and you will have a wonderful dinner. You can easily double or triple the recipe and place extras in the freezer." In a medium bowl, mix together the cottage cheese, egg yolks, and 3/4 teaspoon of salt. Set aside. In a separate bowl, mix together the flour, 1 teaspoon of salt, and baking powder. Pour in the vegetable oil and cold water, and mix or knead into a smooth dough. Roll dough out on a lightly floured surface, and cut into 3 inch circles using a glass, can, or cookie cutter. Place a spoonful of the cottage cheese filling onto each circle. Fold in half, and pinch the edges together to seal. Bring a large pot of lightly salted water to a boil. Carefully drop the perogies into the water, and cook for 3 to 4 minutes, or until they float. Remove from water with a slotted spoon, and place on a cooling rack set over a baking sheet to drain excess water. Just set it and forget it. Come home to cheesy comfort food in your crock pot. Farmers cheese can be used in place of dry-curd cottage cheese. It's so much easier to find. Well, for my first venture into perogies, this went very well. The mix was easy, so these did not take very long to do. Thanks. Boyfriend thinks they are awesome.